Let me preface the following bullet points by saying that I am in no way suggesting that Clint Robinson starts next season on an MLB roster. In all likelihood, the Kansas City Royals will be protecting Robinson on their 40-man roster by the middle of November 2010, preventing Robinson from being grabbed by another team in the Rule 5 Draft. The club wants him to play on a Royals heavy Puerto Rico Baseball League Winter Ball team, thereafter. Robinson will likely then attend Major League Spring Training, but probably start next season in Triple-A, even if it is solely because of team arbitration strategy. There is a huge distinction between being a player who has not yet reached arbitration eligibility and one who has. That’s why many players hope to become super-twos and become arbitration eligible one year earlier than most of their colleagues. Teams are smart, though, and may limit a star player’s MLB time when he is young, to prevent him becoming arbitration eligible as a super-two. There are quite a few teams heading to the playoffs that would want to test his bat in the big leagues right now. My case for Clint Robinson is to let his résumé speak for itself. Triple Crown – The third player in Texas League history to hit for the Triple Crown. He finished the 2010 season with a .335 AVG, 29 HR, and 98 RBI. His HR and RBI total set new records for the Northwest Arkansas Naturals (homerun record previously held by current Major Leaguer Kila Ka’aihue). In addition to winning the Triple Crown, he led the Double-A Texas League in doubles (41), total bases (298), slugging (.625), and on-base-plus-slugging (1.035). Clint was also 2nd in the league in hits (160) and runs (90). Texas League Player of the Week three times and Texas League Player of the Month twice. Selected to the Mid-Season All-Star Team and Post-Season All-Star Team. Named Northwest Arkansas Naturals Player of the Year. 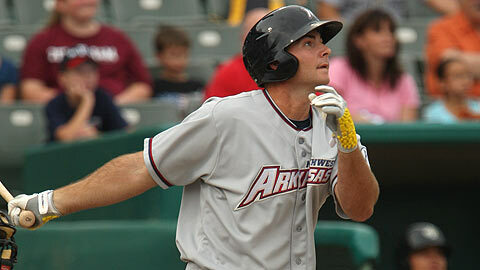 Named Northwest Arkansas Naturals Unsung Hero in 2010. Broke the Northwest Arkansas Naturals hitting streak after hitting safely in 20 consecutive games. Had a high AVG against right-handed pitchers (.341) and left-handed pitchers (.326) and also high on-base-plus-slugging against right (1.074) and left (.967) handed pitching. He is a clutch hitter. His OPS is highest when there are runners in scoring position (1.080). He also averaged a homerun per 14.6 at-bats with runners in scoring position. From August 6-12, 2010, he hit a homerun in five consecutive games (six homeruns in all). Led the Double-A Northwest Arkansas Naturals to a first half and second half division title, and the most wins ever by a Royals affiliate. Recipient of the 2009 Mike Sweeney Award, which is awarded to the player that best represents the Royals organization both on and off the field.